CHICAGO (WLS) -- Some of the season's coldest weather will move into the Chicago area this weekend as overnight temperatures could dip below freezing. 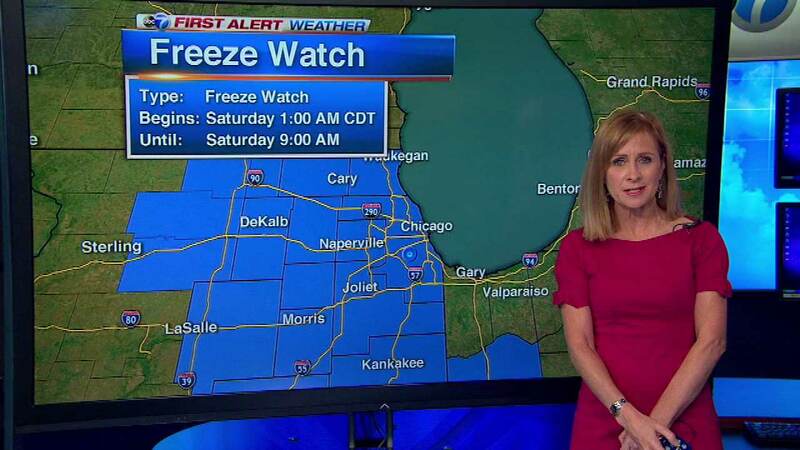 A Freeze Watch has been issued for Saturday from 1-9 a.m. to account for temperatures that will drop to 32 degrees or below, ABC7 Meteorologist Tracy Butler said. Although highs are expected to reach into the 50s later in the day, morning frost is also in the forecast for Sunday morning. Mostly sunny and cool early Wednesday before turning cloudy with some sprinkles. Highs in the low 60s. On Thursday, morning clouds and showers are expected to clear with winds picking up by the afternoon. But the temperature dip will begin Friday, as highs are only expected to reach the low 50s.